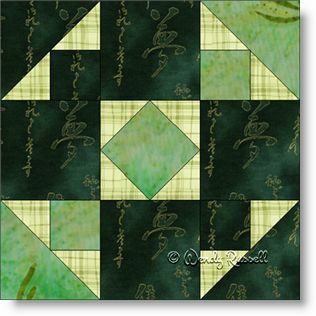 This nine patch block also "stretches your wings" as a quiltmaker if you are a beginner, by the construction of the patches in each of the four corners. (I'm sure there is a name for this arrangement of cut pieces, but it escapes me right now.) All in all, this quilt block is an interesting addition to my ever-growing collection of biblical quilt blocks. The two sample quilts illustrated show a side by side setting of the blocks as well as an on point design layout. Note that the quilt on the left takes advantage of the directional nature of the block. By simple 90 degree rotations of some of the blocks in the quilt, a secondary pattern emerges.